A shower head filter is a great place to start removing toxins from your life. These filters work in varying degrees to remove chemicals, hard water, and other things from your shower, often leading to softer skin and healthier hair. We’ve done our research to bring you only the best of these showers head filters so that you can make an informed decision. Keep these things in mind as you shop. 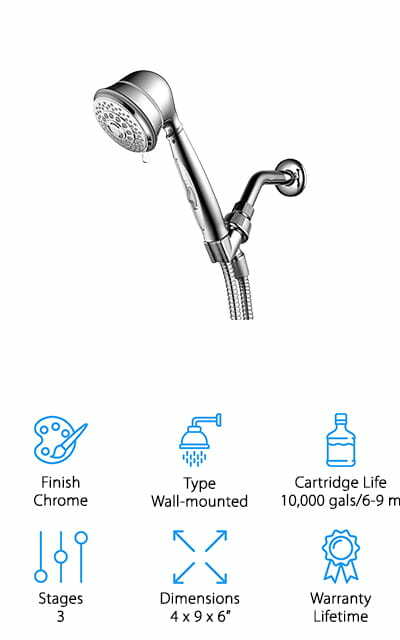 Finish: What color is the shower head? Most of the products on this list have a chrome finish to match your other shower hardware, and the others are a simple white design that still matches your bathroom. Type: These showerheads are either handheld or they mount directly into the wall and can’t be moved. We’ll let you know which this filter is here, though the choice is yours which you’d like to buy. Cartridge Life: The life of the cartridge will tell you how often you’re going to need to buy replacements. This is usually measured in gallons of water or months, whichever happens first. Replacements can be found on the company website. Stages: How many stages of filtration do the water have to go through before making it back out to you? This can tell you what all is being taken out of it so that you get a pure shower. Dimensions: How big is the shower head? For some people, this is a personal preference they can’t ignore. Others might want a showerhead that is bigger or smaller depending on the size of their shower. We’ll tell you. Warranty: A warranty is a guarantee that the company stands behind their products and knows that they will work. If it breaks within this timeframe, you could get a refund or replacement without any additional charges or hassles. Now that you have all of this information, we can show you our shower head filter reviews. We’ve combed the market to find you the best of the available shower head filters. That way, you can make a choice with all of the available information. Our top pick and budget pick are highlights, so check them out first before you trickle down through the rest of the list. 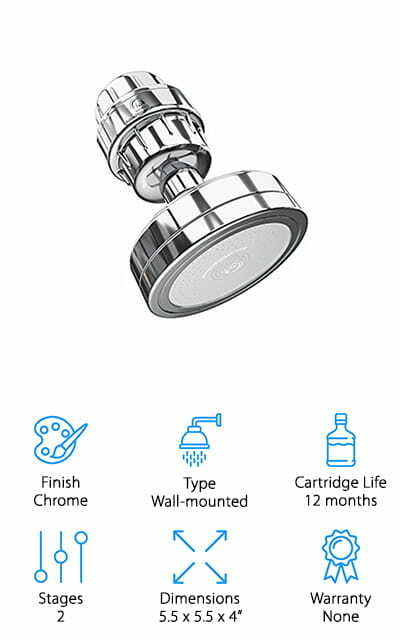 G-Promise makes this great filtered shower head with a lifetime filter to keep water pressure and hard water build-up out of your water. The entire bracket assembly is made of sturdy, solid brass that’s going to hold tight to your shower head when you have it in the bracket. It comes with six different functions – rainfall, power massage, rainfall + power massage, circular massage, rainfall + circular massage, and a water saving mode. 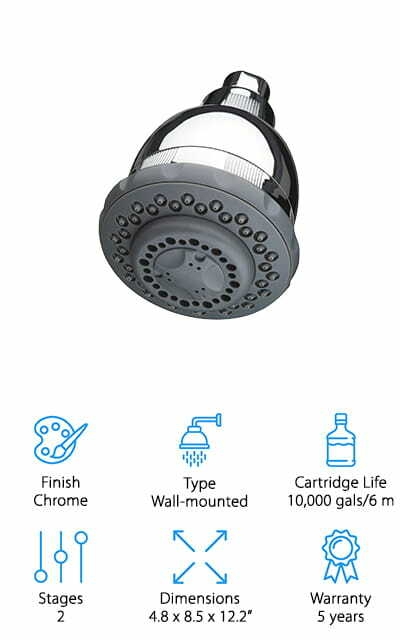 All of the different options make this a great rain shower head filter that you’re going to enjoy relaxing with after a long day. The water saving mode reduces the flow to a trickle while you’re applying your favorite soaps and shampoos to help eliminate water waste during your shower. We love that function! It’s easy to install without the help of anyone else, and it’s great that the filter won’t ever have to be replaced during the lifetime of the shower head. Culligan is, of course, one of the most well-known names in the water business, and that includes shower heads now! There are five spray settings to get the perfect spray that you want in your shower. It is meant to filter out up to 99 percent of chlorine from your water, great for when you live in a big metropolitan area! It’s one of the best shower head filters for hair because of the lack of chlorine, scale, and other impurities. It leaves your skin and hair feeling much softer and cleaner than without the filter. You can install the showerhead in moments, so it isn’t a huge, complicated process to change them out. The filters should be changed every 6 months or 10,000 gallons, whichever comes first. It can also filter out sulfur, which leaves your skin and hair feeling much cleaner and refreshed than normal showers. When you want to shower in safe, clean water, go with Culligan! Aquasana makes one of the best shower head filters for well water because, in addition to reducing chlorine, lead, and iron, it also removes any pesticides, herbicides, and other organic compounds that might be lurking in your well water. This filter makes your water a little gentler on your skin and hair, reducing the harsh chemicals that lead to over drying and producing healthier hair and soft skin. All of the breathable chemicals in your shower water are gone, allowing you to breathe easier while you’re washing up. This shower head has multiple massage settings as well, so you can work on relaxing after a long day. The ability to customize your shower mixed with one of the longest-lasting filters on a shower head system places Aquasana right on our list. The combination of coconut shell, carbon, and copper-zinc in the filter give you an amazing showering experience. You’re going to love how it makes your hair and skin feel. AquaBliss’s multi-stage filter will last you through an amazing 12,000 gallons of water, or 8 months (whichever comes first). There are three stages in the filter, and they work together to remove heavy metals, bacteria, pesticides, and most importantly, chlorine. Plus, it stops the grown of fungi, mold, and scale from hard water, so that the water that reaches your skin and hair is much better for you. If you’re having an issue with the hard water in your shower, you should definitely check out this filter from AquaBliss. It’s one of the best shower head filters for hard water because of the number of stages that it takes the water through before it reaches you. It’s also a great shower head filter for hair because of all of the healthful benefits of eliminating these toxins from your shower water. You will definitely see a difference in the way that you feel after you’ve started using this filter! 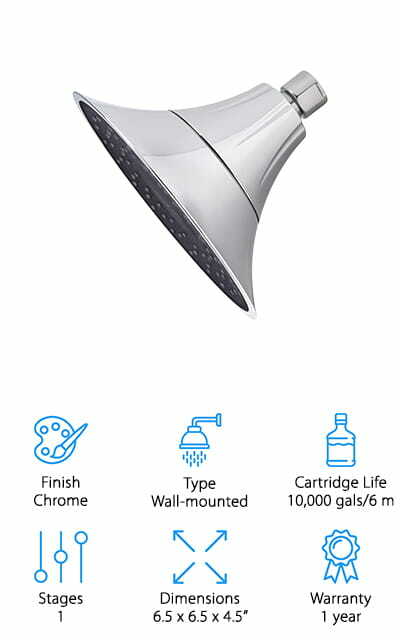 Much like the well-known Berkey shower head filter, this system from Barclays is a high-quality system with a great design. Instead of a plastic O-ring, this shower head uses a metal one that won’t leak or crack after prolonged use. The filter has an ion box, a sponge filter, and a calcium-sulfite layer to filter out chlorine, solids, and other chemicals from your shower water. There are three different settings on the showerhead, including a rain spray, a non-pulsating massage, and a combined that gives you the best of both worlds after a long day. Who doesn’t want to come home to a nice pure shower after they’ve worked all day? The pressure on this shower head will remain under 2.5 gallons per minute to conserve water, and that’s a pretty awesome feature according to us. The different settings definitely set this shower head apart from some of the others that we looked at. This handheld showerhead by HotelSpa is packed full of amazing features, not least of them the 3-stage filtration system that will help you take an amazing shower. It uses active carbon to filter out chlorine, metals, mildew, mold, and even pesticides. You don’t need to have anyone come out to put it on, as you can do it yourself fairly easily. 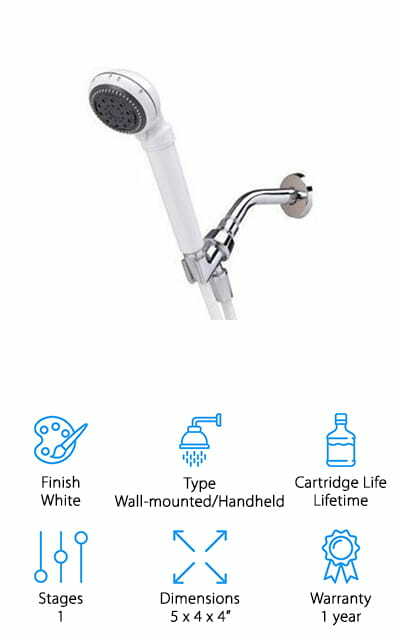 No shower head filter review list would be complete without this product, which contains a pause switch to slow the water flow down to a trickle while you soap up without wasting a ton of water. 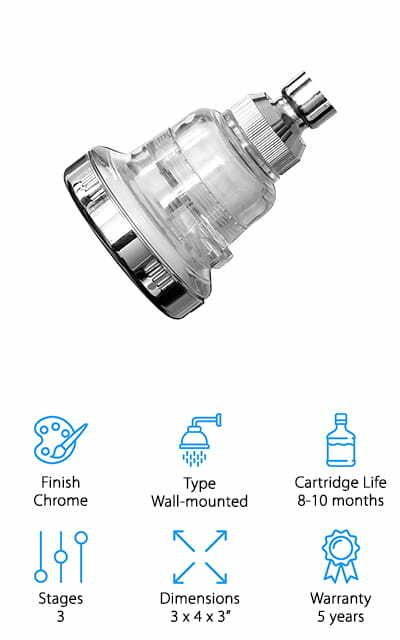 One of the best things about this shower filter is the long-lasting cartridges, which will last about 9 months or 10,000 gallons, depending on how often you use the shower. Plus, it comes with a lifetime warranty if it doesn’t work right for some reason. You can’t beat that! It comes with a ton of features, including a flexible bracket. This shower head from AquaHomeGroup is a powerful, wide, wall-mounted shower head that will definitely improve the way that you shower! It comes with some accessories, including Vitamin C cartridges so you can infuse your shower water yourself, as well as 5 shower caps that may come in handy for you. This 2-stage filter removes most heavy metals, pesticides, bacteria, and chloramine. 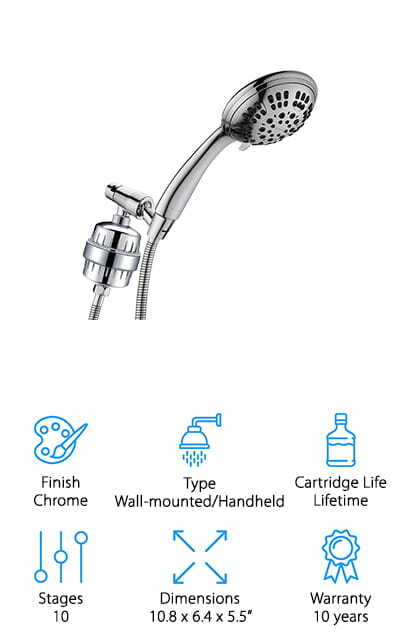 You’re going to have the best shower in a long time with this shower head filter! You can install in just a few moments without any tools, and it fits a variety of shower types. You can replace the filters from the listing as well, so you won’t ever run out! It’s made of heavy-duty aluminum, and the vitamin C cartridge is meant to last an entire year before you need to purchase another one! That’s pretty amazing. It’s one of the best shower head filters for iron that we could find in our research, too! Sprite makes this shower head, and it nearly rivals the Brita shower head filter with its features. There is a single stage of filtration to get chlorine and vapors out of your water and give you a wonderful, clean experience while you shower. There are five different spray and pulse settings to help massage your sore muscles and soothe them after a long day. By removing the chlorine from your shower water, your skin and hair are going to feel much better and much healthier. Using a shower filter can help improve dry skin issues and other problems. Plus, you’ll be able to breathe easier without chlorine fumes in your shower! You can install the Sprite shower filter without any tools or help because it just screws into place so that you can get to your shower faster. This is an amazing filter with a lifetime cartridge that doesn’t have to be replaced until you replace the entire unit. 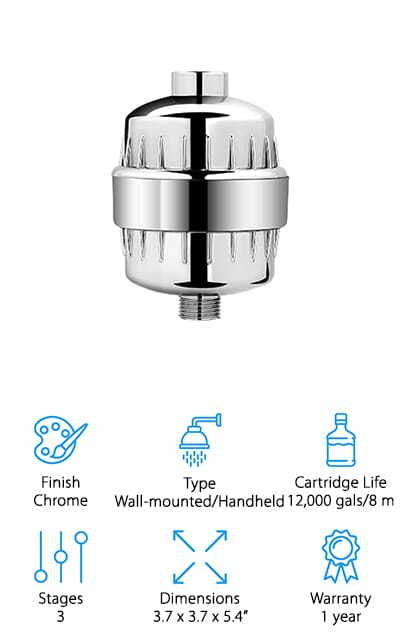 The VivaSpring Filtered Showerhead is a great, stylish head that is going to look great in your bathroom! Inside this beautifully-designed shower head is a great filter system that helps remove contaminants like chlorine, copper, mercury, and lead from the water you’re washing with. It also works as an anti-bacterial, making sure that no mold, mildew, or bacteria is going to grow inside your shower head. What’s unique about this particular product is that it has a wide spray, about 6.5 inches in diameter. This means that it’s going to cover a wider area, so if you prefer to get more coverage out of your showerhead, this is probably the one you should look at. The filters last six months or 10,000 gallons (whichever comes first) and when you purchase the shower head, it comes with your first filter. That’s pretty amazing. For softer skin and a purer shower, you can’t beat the VivaSpring filtered shower head. 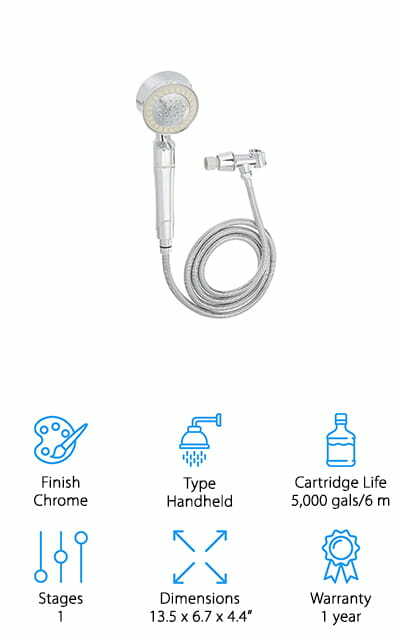 Sprite is back on our list again with the Cascade Shower Head, a handheld shower filter that helps to reduce the amount of chlorine, dirt, and odors found in your shower water. There are five different massage and spray settings to make your shower that much more relaxing, and you can direct the spray right where you need it with the help of the 72-inch double-coil hose that gives you the freedom of movement in your shower. It comes with one replaceable filter cartridge, and you’ll have to purchase a new one every 5,000 gallons, or three months. 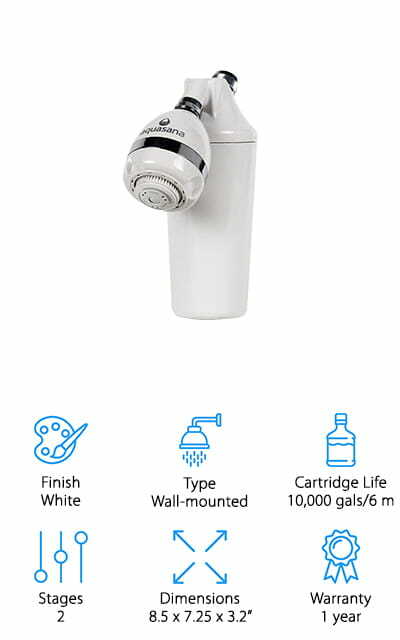 This is an amazing filter that you’re going to love using, with all of the different settings and the advanced filtration technology that keeps you shower water pure so you can get clean without the drying effects of chlorine and other chemicals. Boost your showers with this amazing new shower filter head and all of the great benefits it has!